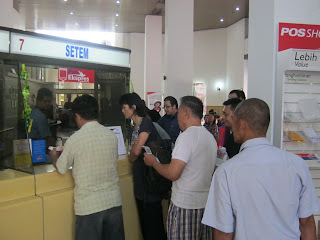 When I first arrived at the Main Post Office in KK just before 8am this morning, there was already a long queue in front of the entrance. I told myself that there must be a first day cover released today, but I am not sure what theme is being released today. The crowd seems to be very excited telling each other how early they have been here at the post office. I did not line along with the queue because I do not need to take any queuing number from the counter, I just need to buy stamps to send my products off to my buyers as usual. 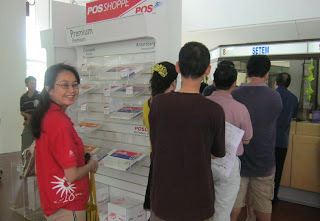 Before the door was opened, the post office staff informed the people in the queue that there are limited numbers of First Day Covers for everyone, for those who have registered their names the day before will get theirs and no additional are available for sale if they want more, some might not get a complete set. With no idea of what's being released, Clet and I proceed to buy our stamps at the other counter. After almost done with sticking the stamps on our posts, one of the elderly lady holding her First Day Cover envelope and stamps on her hands and puzzling how to place it on the envelope, with her asking for help, I moved over to help her out. 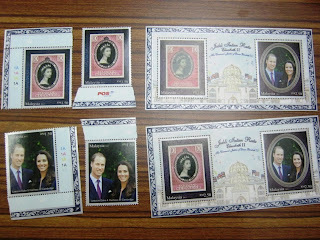 I was surprise to see this special release of these new stamps for The Diamond Jubilee for Queen Elizabeth II, there is also stamp for the Duke and Duchess of Cambridge, Prince William and his wife Catherine. 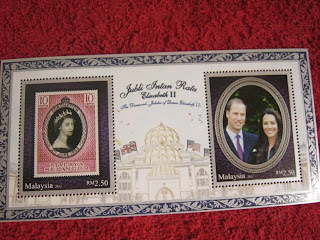 These stamps are so nice that I want to have them instantly. 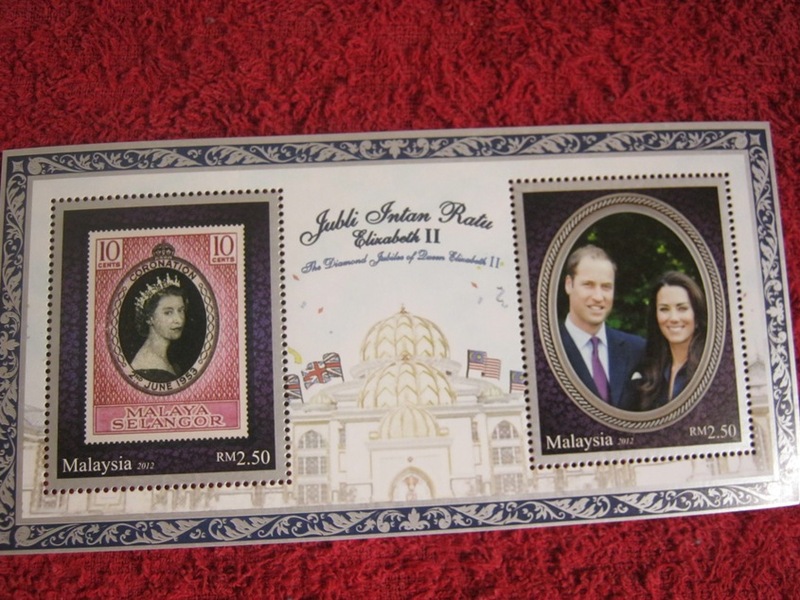 The best is the Duke and Duchess has actually arrived in Kota Kinabalu last night, they are actually here in Sabah for their 2-day visit. It is very meaningful day to have the First Day Cover. 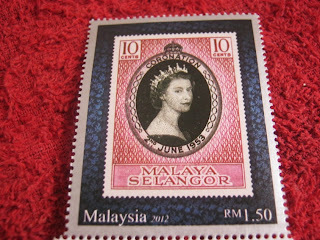 I quickly queue up (the queue has became shorter by then) hoping for a chance to get this set of stamps. Luckily Clet helped to queue up on the other line which he got his turn before me. We did not manage to get any First Day Cover's envelope and folder, they were all sold out. 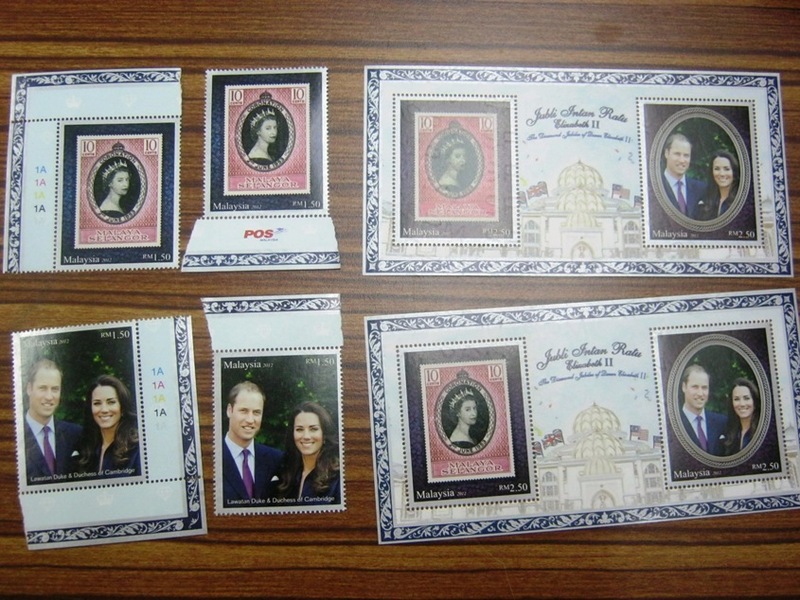 But I am happy to get hold of 2 sets of the stamps. They are meant to be kept for my 2 little girls. 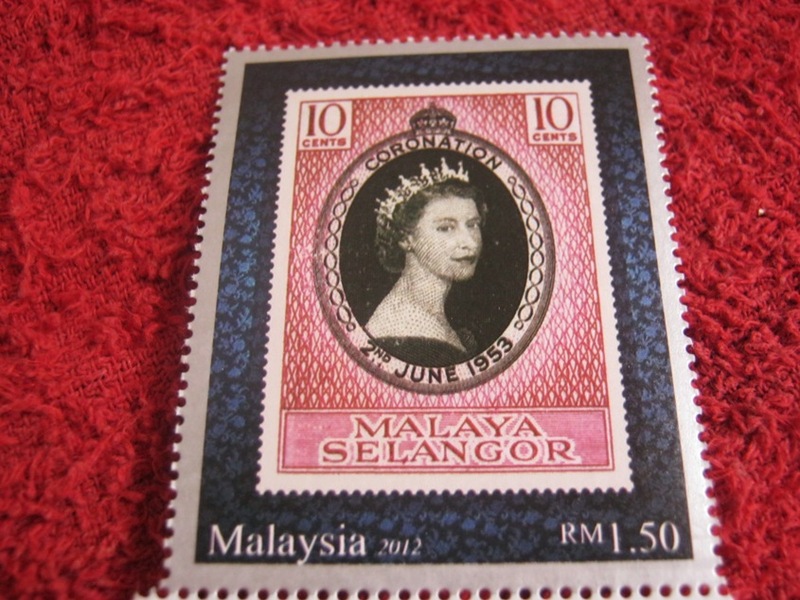 A "stamp on stamp" design, with an older stamp which was released on June 2, 1953 to commemorate the coronation of Queen Elizabeth II, it is now being re-released after 60 years, the Diamond Jubilee of Her Majesty on the throne. RM1.50 per piece. 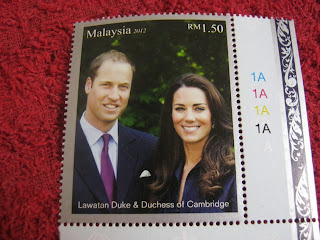 I ended up late to work this morning (slightly la) because of this, I can't kept my excitement having those stamps that I showed them to my colleagues, they all got excited too..one of my colleague walked all the way to Tanjung Aru Post office to buy these stamps but returned with disappointment that these stamps have not arrived to their post office yet. I would have missed this fabulous First Day Cover if I hadn't gone to the main post office today.